"Poetry." Merriam-Webster, 2016. Web. 29 Mar. 2016. <http://www.merriam-webster.com/dictionary/poetry>. Every weekday original poems are sent out via email, the web, and social media to 500,000+ readers. You can sign up here. Perhaps students or teachers could take it in turns to read a poem aloud each morning. Every week, an email is sent to K-12 educators, featuring one poem with resources and classroom activities. 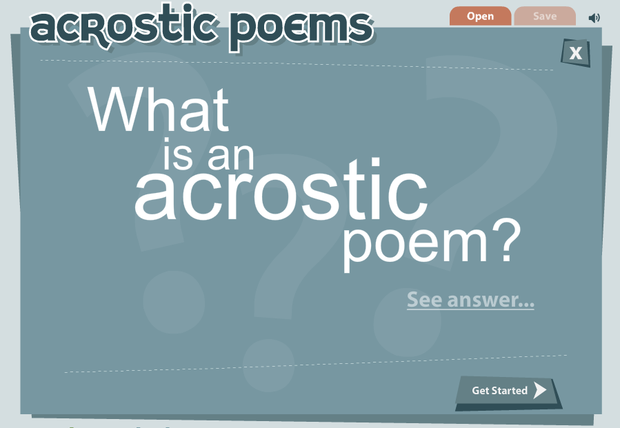 It’s designed to help teachers quickly and easily bring poetry into the classroom. You can sign up here. Students in grade 5 to 12 are invited to write letters in response to poems written and read by some of the award-winning poets. Find out more here. This could be in your class, or perhaps as a lunchtime or after school activity. Find more tips on starting a group here. Check out the following games and poetry generators here. 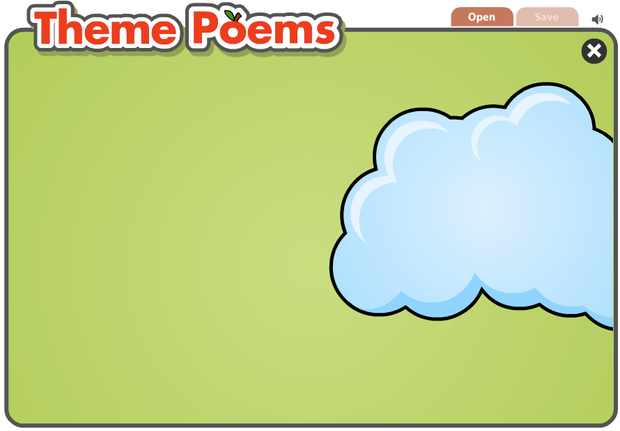 Let your students create their own poems with easy to use tool! Learn the many ways to write poetry and create your own haiku, limerick, cinquain, or free verse poem with the Poetry Idea Engine. 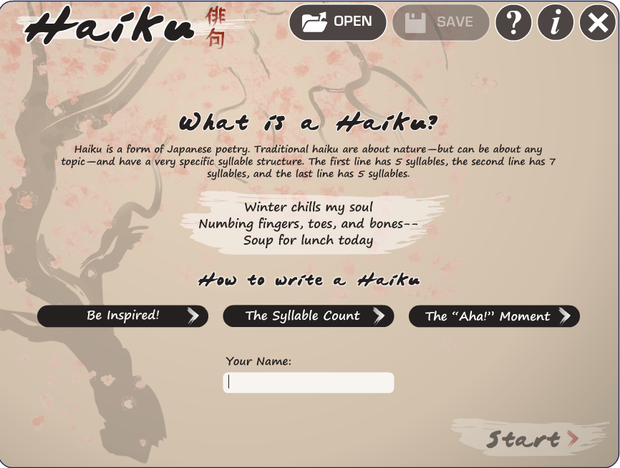 Students can learn about and write haiku using this app that guides them through the writing process. 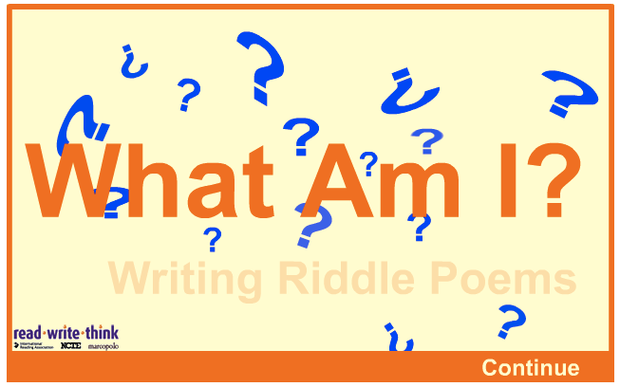 The Riddle Interactive outlines the characteristics of riddle poems and provides direct instruction on the prewriting and drafting process for writing original riddle poems. Dear Poet Project 2019 - For National Poetry Month 2019, we present Dear Poet, a multimedia education project inviting young people in grades five through twelve to write letters in response to poems written and read by some of the award-winning poets who serve on the Academy of American Poets Board of Chancellors. Students can participate in this year’s Dear Poet project by watching the videos below of Chancellors reading and discussing one of their poems. April is National Poetry Month, 30 days of celebrating the joy, expressiveness, and pure delight of poetry. Learn more about the National Poetry Month, get to know some of our most well-loved children's poets in our video interview series, browse the many online resources listed here, and visit your local library or bookstore to discover wonderful new books and anthologies.